The name of Martin Luther remains unknown to most in the Roman Catholic Church, and many of those who know of him blame him for dividing Christianity and causing disunity. Yet remember Martin was a Catholic. He tried to bring about change within the Catholic Church. He didn’t want to start a revolution against her. Only after Church leaders expelled him did Luther resort to pursue a new church practice apart from the Roman Catholic institution. However, Protestants lessen their Christian heritage if they view Catholics with disdain for pushing Luther away. In the same way, Catholics miss a greater faith perspective if they regard Protestants as rebels. We’re on the same side. We pursue a comparable faith in the same God. The Bible is common to our faith. Christian unity should be the mutual intent of Protestants and Catholics. We must strive to get along. 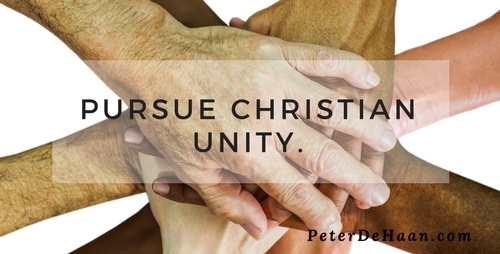 Our unity will point people to Jesus. Our lack of harmony will repel them. Protestants can celebrate that the Roman Catholic Church later went through its own mini-reformation. This Counter-Reformation corrected many of the errors Luther had pointed out. Though the Roman Catholic Church leaders’ reactions to him (and others like him) sparked the Protestant Reformation, the Roman Catholic Church is not the enemy of Protestantism. We are not at war. Though not his intention, Luther, however, did divide the Church. He diluted the Christian stream of Catholicism. Furthermore, note that Protestantism never enjoyed unity within itself. It started as multiple opposing factions. These groups further divided over the centuries that followed to become 43,000 splintered denominations today. For all the good the Protestant Reformation accomplished, the painful outcome produced massive division, something the Roman Catholics have smartly avoided. The Roman Catholic Church’s initial response to Luther and his criticism of their practices was opposition. This stands as a typical posture of an institution when attacked. Yet, their attitude went beyond resistance to Martin’s words. They grew hostile, both vicious and vile, toward his person. Though not excusable, we can understand this reaction. The Catholic hostility toward Luther continued for over four centuries. A turning point came in 1937 when Joseph Lortz, a Catholic professor, published a two-volume book on Luther. His work provided a balanced, scholarly review of Luther. This advanced a better understanding for Catholics of this much-maligned man. To move forward, we can embrace both Catholicism and Protestantism as equal facets of Christianity. We both follow the teaching of Jesus, albeit from different historical traditions. With much more to unite than to divide, both groups must acknowledge that neither approach to faith is error-free or superior, just different. his harmony will let the world know that the Father sent Jesus to us, John 17:21, 23. May Catholics and Protestants work together to point the world to God the Father, through Jesus.